1 || After the debut of my pillows on Society Social I have been spending way too much time on this site coveting everything and I have fallen in love with this sofa. It would be so fabulous in a library. 2 || I fell prey to groupthink and bought myself this t-shirt. I will let you know once I get it, but it is supposed to be super soft. 3 || I started watching Season 1 of Downton Abbey. OMG, I can't believe I had lived without seeing it this long. I'm so in love with Matthew Crawly. What a wonderful series, so beautifully written and acted. I love learning about the nuances of everyday life during the early 1900s. 5 || Did you see my guest post in Because it's awesome? I worked really hard on it so I'm particularly proud of it. It is all about choosing a color palette that really works. Happy Weekend loves. Have a wonderful one! Ohh that sofa, LOVE it love it love it! I still haven't watched DA, not sure yet if I'd like it, maybe I need to give it a try? Happy weekend! Hooray for having the parents in town for the weekend. Girl, you guest post yesterday was a freaking color tutorial. I'm gonna be referencing it in the future for sho. I so need to watch that Downton Abbey. One of my BFFs has been raving about it endlessly but I just got sucked into Scandal and can only handle one TV obsession at a time. Anywho, TGIF. And cheers to the freaking weekend. Have a great time with your parents! I need to get on the Downton Abbey bandwagon, is it that good? I will take your word for it and I'll get it on netflix:) have a great weekend Albertina! Love your collahh! Loved your post on Tobe's blog. I can tell you spent a long time on it. It shows and is absolutely beautiful!! Ahh, I love that ring! I wish it was just a tinsy bit cheaper! I just popped over to see your guest post. It certainly shows that you spent a long time creating it. I love the purple and yellow together. Enjoy the time with your parents. Albertina you did a masterful job on that guest post! Very impressive and complete! Great job! Have a wonderful weekend. I'm so jealous that you're only on Season 1! I'm all caught up which is a bummer. We did the binge DVD watching at our house over the summer. I'm off to check out your links! I need to watch DA, my roommate and her bf are obsessed but I never have a clue as to what is going on! Your series on Because it's Awesome was so fab- I just went back to read it again for the 3rd time :) I need color inspiration in my home and your post was just the ticket! Have a great weekend with the rents, Albertina ! Congrats on the Social Society partnering up! That's fantastic! And post how you like the shirt! I've been dying for one and didn't know where to get one until you just shared the link! Heading over to Because It's Awesome now! I love colors!!! And your color combo are really beautiful! 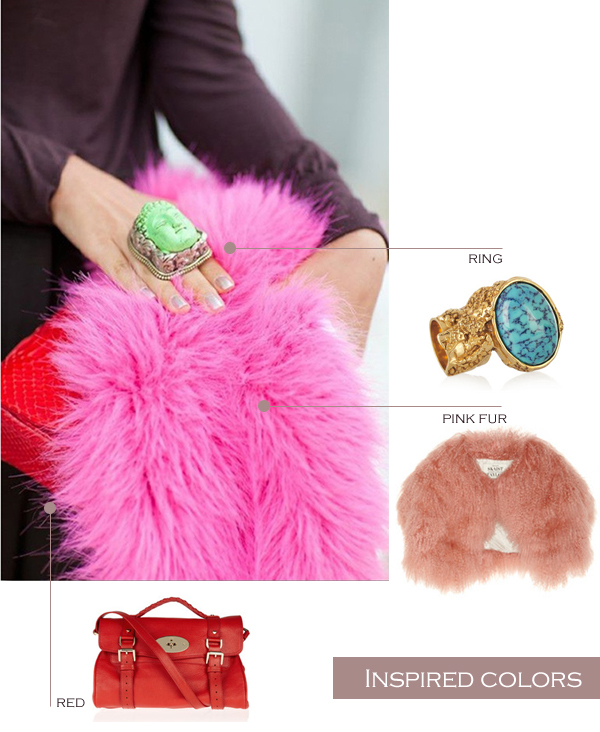 I have a thing for color...like a really big thing! But for a while now (since the end of summer) I have been on a major color detox. It had never happened to me before, but I actually could not stand to wear or be surrounded in my home by anything but neutrals. So weird!! BUT, I am happy to report that I am once again feeling incredibly drawn to and inspired by color, color, color!!! Perhaps it is the desire for spring, I don't know for sure...but I do know that it is a joyous time for me :) Okay, totally rambling... so, bottom line is that all of that color makes me SO happy & inspired! Oh, and just checked out your color feature - amazing!!! well done, lady :) Happy, happy weekend to you :) p.s. now following you on instagram! Uh oh...do I need that tee?!?! I'm picturing that pink fur draped around it!! Eeeeek! i've been wondering if i should start downton abbey, maybe i will now!